When the time arrives for your family to set out to conquer the great beyond on your first camping trip, you’ll want to ensure you’re properly prepared. Camping is a fun vacation for everyone, but it’s not the same as staying in a luxury hotel by any stretch of the imagination. You have to cook, clean and entertain yourself, and in this case, the kids, too. Follow the advice of these 30 blogs to make sure your first family camping trip is one to remember. When most people think of camping, they imagine tents, the wilderness, bears and adventures all around. While some or all of those things are what you might see on your camping trip, they aren’t the be-all and end-all of camping life. Camping out has come a long way since the days of sleeping under the stars. For your first trip, you can jump straight into the full wilderness experience, but you may want to consider a more luxurious set-up. These five blogs will give you an idea of the different trends in camping, so you can choose a site that suits your family best. No matter where you choose for your first camping trip, you are going to need to bring the appropriate gear with you. Less is best, in the sense that you won’t want to be hauling huge amounts of gear around with you everywhere that you go. With that said, having the right gear with you is also essential to a great camping trip. Here are five blogs with tips on the kind of gear that will make life so much easier on your first family camping trip. Whether you are hiking, climbing or swimming in rivers and lakes, you absolutely must learn some essential wilderness survival skills. Although camping is an enriching experience, there are plenty of dangers that you may encounter. You won’t regret being prepared, should you get into trouble during your camping trip. In these five blogs you will find a number of tools to help improve your wilderness survival skills, as well as hints and tips on how to stay safe and what to do in an emergency. Being able to prepare and cook food in the wilderness is a skill in itself, and one that’s not all that closely related to cooking in a well-stocked kitchen. It is not something you can pick up on the fly, so take the time now to gain the skills you will need. There are some great tools and gear that will help you along, but for the rest you’re going to have to go at it alone. To help you get a head start, these five blogs have expert advice on preparing and cooking food on a camping trip. Remember, you’re going to need to keep the kids entertained on your camping trip, too. There won’t be a TV, gaming console or any of the other modern conveniences that they are used to. Finding free and easy activities, however, will keep them busy. These five blogs contain some great ideas for activities in the great outdoors. It is very important, while camping, to make sure you leave the site as you found it and don’t upset the natural ecosystem. For this reason, you should always keep environmental awareness and hygiene in mind. Work in synchronization with nature by following the advice in these five excellent blogs. How to Keep Clean when Camping! Spending long days outdoors during hot summer months is par for the course for kids on summer vacation. Young children, however, don’t adjust as well as adults do to terribly hot temperatures. Their body surface is greater in comparison to adults and they sweat less, which makes it harder to get rid of body heat and can lead to dehydration. Keeping kids hydrated while they’re active and outdoors is a priority. Check out these tips for stopping dehydration before it starts. Kids should start out the day eating yogurt and drinking milk because these items contain higher levels of fluids and are loaded with calcium and vitamin D. Fruits, sugar-free popsicles and watery vegetables are great options for healthy snacks the kids can grab throughout the day. If you cut up the fruit and vegetables and keep them in plastic bags or resealable bowls, the kids can help themselves when they need a snack instead of bugging you all the time. For more ideas on what your kids should eat to stay hydrated, check out these seven blog entries. 5 Tips for Keeping Your Kids Hydrated in Summer Weather Have the kids eat plenty of fruit, which is both a nutritious snack and will also hydrate them. Hydration—Children and the Elderly You might want to reduce the amount of protein that your kids consume during hot summer days because it takes more water for your body to metabolize it. Happy to be Hydrated Serve your kids watery fruits and veggies when they need an afternoon snack, like watermelon and cucumbers. 10 Ways to Keep Your Child Hydrated in the Summer Keep fruit on hand, that way your kids can snack on something that will help hydrate them at the same time. How to Keep Your Kids and Yourself Hydrated this Hot Season Have your kids start their day with yogurt and let them drink smoothies as a snack. Summer Sun: 5 Tips for Preparing Your Kids for Outdoor Activities Encourage your kids to eat healthy snacks throughout the day, especially fruit. 6 Cool Kid Snacks for the Hot Summer Serve your kids cucumber sandwiches and salads sprinkled with chopped fruit. Water is hands down the best thing that kids and adults should drink. However, sometimes it’s hard to get kids to drink plain water. If that happens, then you can try dressing up the water by adding sliced fruit to it to change the flavor. Sports drinks are not necessary for most kids unless they are involved in high intensity athletics. For more ways to get your kids to drink healthy liquids this summer, take a look at these seven blog articles. Hydration: Notes from a Sweaty Kid You can make your own sports drink using things you may already have around the house. Keeping Cool: Good Hydration Habits for Kids Make sure that your child takes regular water breaks, even if he doesn’t think he’s thirsty. Keeping Kids Hydrated Watch this short video from a healthcare professional regarding what you should give kids to drink in the summer. 5 Keys to Keeping Your Kids Healthy and Hydrated this Summer Make sure that your kids drink plenty of water so that they stay healthy and hydrated. Keeping Kids Hydrated this Summer—6 Quick and Easy Tips Bring reusable water bottles with you whenever you go out. Beat the Heat: 7 Delicious Ways to Keep Kids Hydrated this Summer Have a water drinking contest between you and your kids to get them inspired to drink more water. Get Your Drink On: Tips for Staying Hydrated this Summer Flavor up some water to get your kids to drink more by using flavor packets that are sweetened naturally. In these seven blog posts you’ll find tips and tricks to keep the kids hydrated during the hot summer months. Two good tips to implement are taking a break in the shade every hour and carrying a water bottle with you everywhere you go. Take a look at these blogs and have a safe summer. How to Prevent Dehydration in Kids During the Summer Months Encourage the kids to play or at least rest in the shade as often as possible. Keep Kids Hydrated in Newberg The recommendation in this blog post is to have the kids take it easy during athletic practices for the first few times once the temperatures start rising so that their bodies can acclimate. Ways to Beat the Heat and Stay Healthy and Hydrated Keep moving during the summer, but don’t forget to do some indoor activities also. Tips for Keeping Your Children (and Yourself) Well-Hydrated this Summer Make your own sport drink and eat frequent watery fruits as snacks. Keep Your Kid Athlete Nourished and Hydrated—Before, During and After Sports Follow this guideline as to when and how much you should be giving your child to eat and drink before a sporting event. 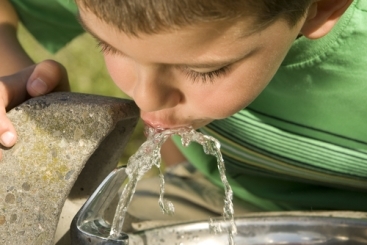 7 Ways to Keep Kids Hydrated this Summer Stay out of the sun when it’s at its highest point in the day. Tips for Keeping Kids Hydrated in the Heat Let the kids pick out their own nifty water bottle to encourage them to keep it with them all summer long.